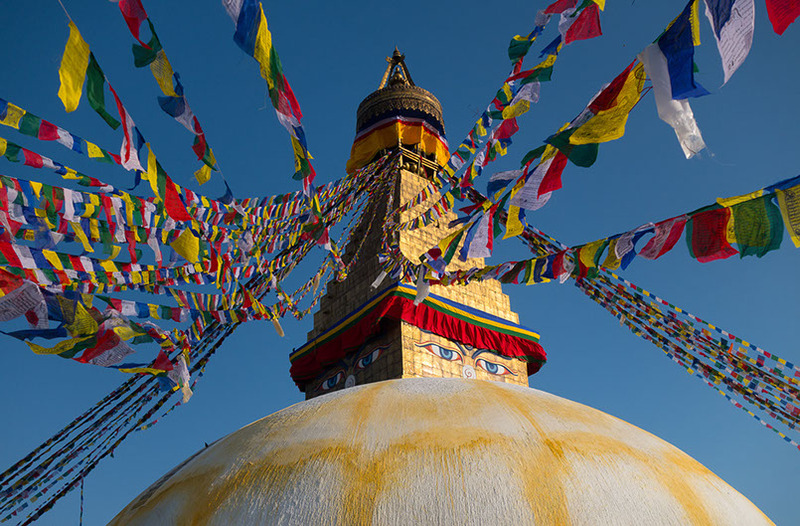 Kathmandu – just the name itself evokes something exotic for most people. It’s been my home away from home for the past 32 years. At the moment, my relief at having survived one of the most dangerous stretches of road in the world – the Prithvi highway connecting Pokhara to Kathmandu – is instantly replaced by a wonderful sense of the familiar as I look down on the sprawling mass of Kathmandu valley. 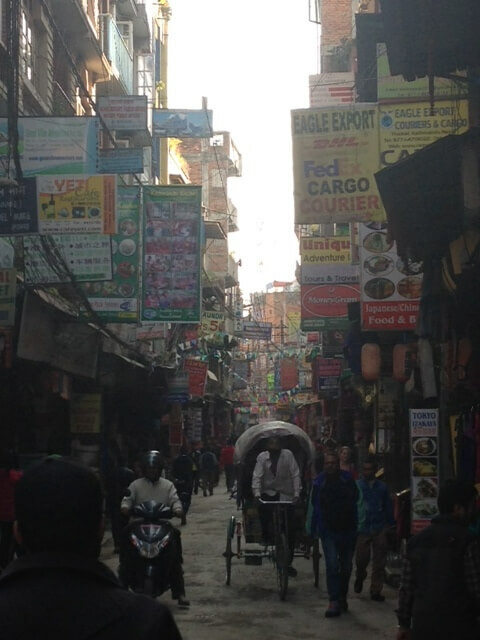 I can’t help but smile as I drive my Enfield through the tight streets and bustling bazaars, past old landmarks, sounds and smells… heading deeper into the heart of the backpacker’s neighborhood of Thamel – my old stomping grounds. For centuries, spiritual pilgrims, intrepid travelers, and hardy traders ventured by foot over high, mountain passes to enter the Kingdom of Nepal. Modern-day Himalayan exploration basically grew out of the British Empire’s efforts to map and survey the Indian Sub-continent. These exploits are well documented in the annals of history and make for fascinating reading…Peter Hopkirk’s “The Great Game” remains one of my favorite books. 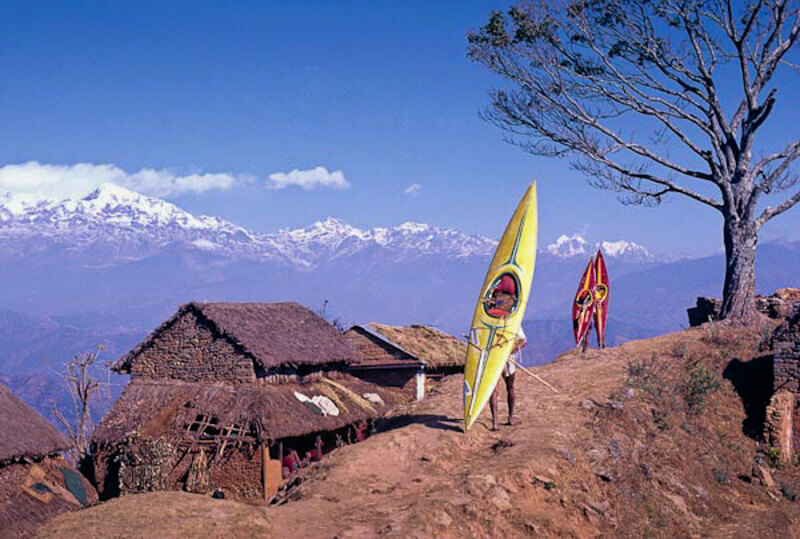 Though those grand days were long gone by the time I arrived in Nepal in 1983, I had accidentally wandered into a new and equally exciting era of adventure travel that was just getting underway in the Himalayas. When I first arrived, the country’s river systems were pristine, unchartered territories – ripe for exploring; a veritable paradise filled with tropical jungles, white sandy beaches and abundant wildlife. There were no guidebooks yet and very few rules… this was adventure in its most authentic form. For a young Scotsman, it was a whole new world – and so very different than the streets of Edinburgh. Nepal captivated me from the start. I remember thinking that going home to Scotland – penniless in the depths of winter to boot – was going to be utterly depressing, to say the least. As it turned out, the universe had other plans in store for me. 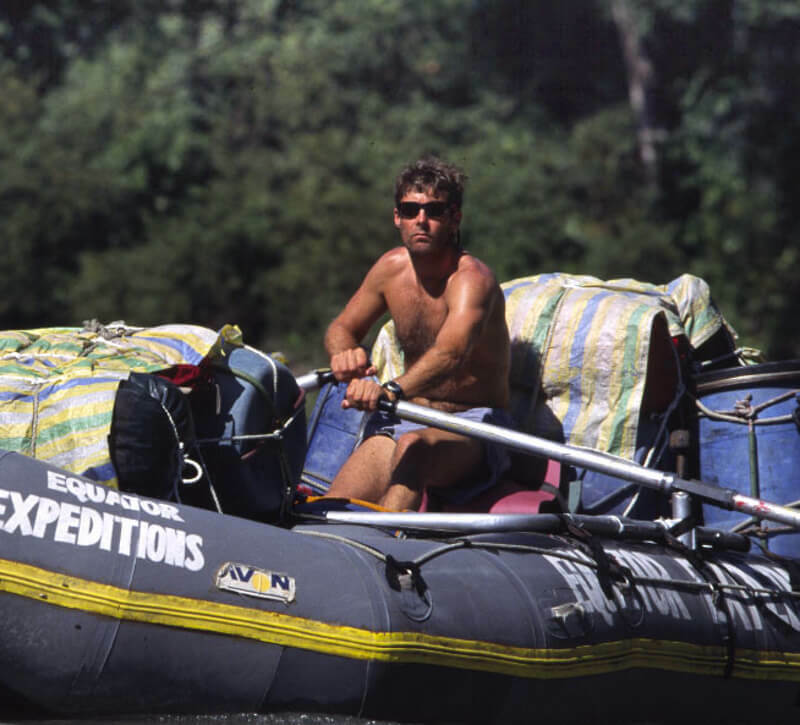 Following a series of fortuitous events only days before my scheduled departure for home, I was offered a job as a trainee river guide for the one of the world’s great expedition outfits – Encounter Overland (EO). Needless to say – I jumped on the opportunity…and I never looked back. 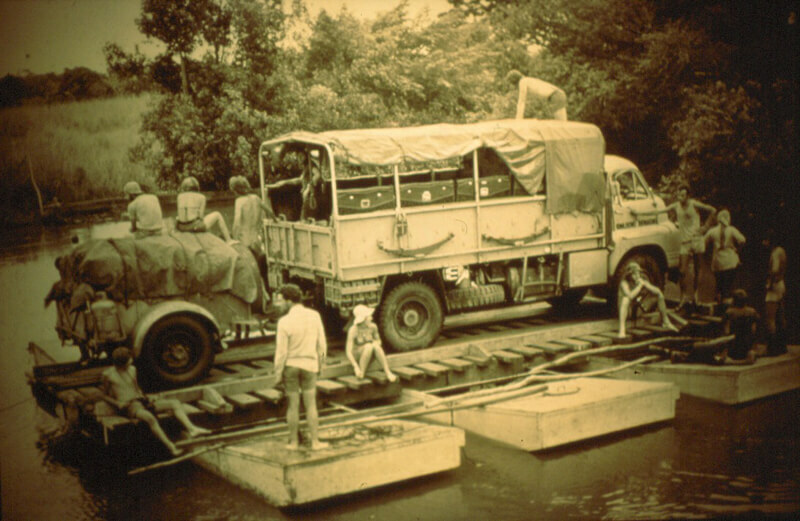 EO were the pioneers of modern British overland expeditioning. The company specialized in facilitating months-long, trans-continental overlanding across Asia, Africa and South America. EO expeditions involved groups of around 20 travelers crossing a continent in the back of a burly, self-sufficient overlanding vehicle with only one do-it-all leader/driver to manage affairs. In its heyday, EO had 38 trucks going at any given time, crossing 3 different continents. Political turmoil, natural disasters, crazy group dynamics and good old crises and predicaments were the order of the day. It was the group’s mission to overcome obstacles by any means necessary. The true extent of the company’s influence on the adventure travel industry isn’t often fully credited, but suffice to say, EO was a fixture during one of the golden modern eras of adventure travel. Sadly, given the geopolitical conflicts of today’s world, it’s an era that will most likely never be duplicated. 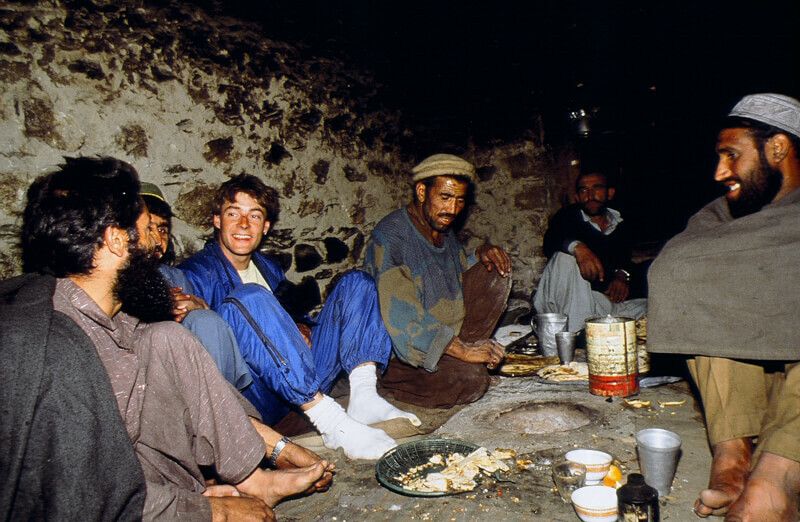 Though I was only 18 and living on my own in Kathmandu, I was lucky to be surrounded and mentored by some of the most experienced and capable expedition leaders in the world. Listening to their stories instilled in me an enduring love for epic adventures, and I idolized them all for the places they had traveled and what they’d accomplished. Their spirit of adventure was undeniably authentic and they took great pride in telling it like it really was. This was a group of guys who worked hard – and played even harder – and that suited me just fine. Moderation was not exactly my forte… for better and for worse – a trait I shared with many of my colleagues who enjoyed the excesses of expat life. Fortunately, I spent significantly more time working in the field than hanging out in the streets of Kathmandu, or I doubt I would be sitting here today. At EO, I cut my teeth on handling the unusual, the unexpected, and the demanding. I remember one such scenario well. It was a Thursday evening and I was in a pub back in London on a well-deserved break after 8 months in the field. Out of the blue, I received a message to contact HQ immediately. By early next morning, I was at the Pakistan embassy applying for an expedited visa. Two days later, my 3am flight landed in Islamabad and by 7 am I’d picked up my group and was embarking on the first of 4 expeditions over Pakistan’s Karakorum highway to Kashgar in China. The fact that I’d never even traveled to the area was the least of anyone’s concerns. I was assigned at the last minute due to a serious disaster with the previous expedition. One of the jeeps had broken a steering arm, plummeting into the maelstrom of Swat river – killing and severely injuring several of the expedition members. Traumatized by the process of repatriating bodies and the nightmare of Pakistani bureaucracy, the expedition leader was a mess and the company though it best to replace him on the next series of scheduled departures. Hence, I was redeployed to “continue business as usual” with the next groups. The average tenure for an EO expedition leader was only around 3 years due to stress, the nomadic lifestyle and excessive partying. That said, there were many of us who loved the lifestyle and wouldn’t quit. I lasted through 6 years of back-to-back expeditions myself. However, after that amount of time, I can honestly say I was burned-out, partied-out, disgruntled and fed up, with a bad attitude to boot and…I was rightfully fired. Now at the ripe age of 24, I was already a hardened veteran of the black market, handling messy group dynamics, on-the-spot problem-solving and wild Himalayan river exploration…so of course there was nothing else to do but get some friends together and start our own expedition company! Our company, Equator Expeditions, specialized in skills-based adventure travel activities – specifically rafting, kayaking, climbing and trekking. In the 90’s tourism really began to explode and the adventure industry entered a new and exciting period of growth. Equator rode that wave high and far. During our hey-day, my partners Guy Robins and Mahendra Thapa and I employed over 60 people and led over 50 expeditions per year with over 2000 clients. Pakistan, India, Tibet, Sikkim andBhutan became destinations I regularly ventured to, but Kathmandu was always home. 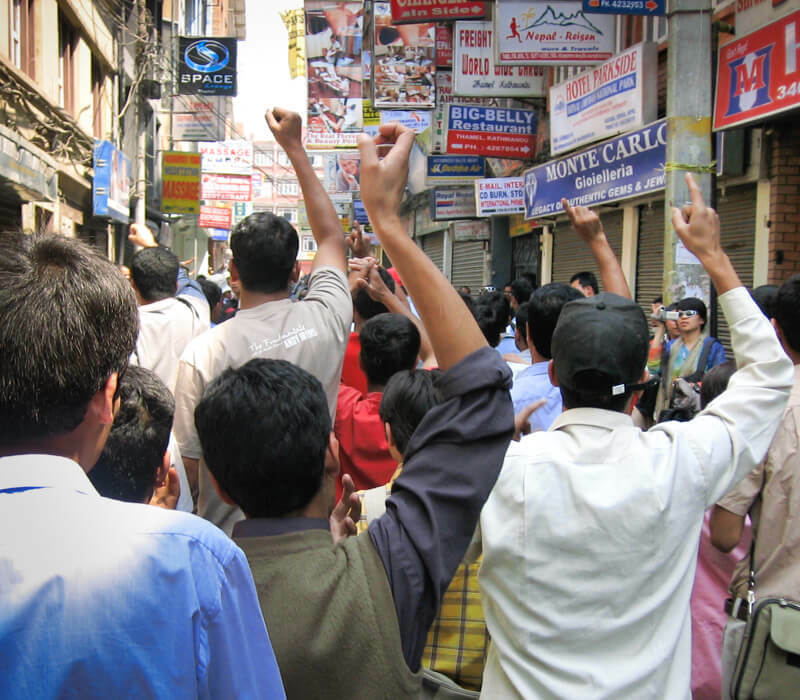 My Kathmandu office was mayhem during high season – a general all-round happening place to be and meet fellow travelers. On one particularly busy day, I remember watching this guy sitting in the corner by himself, just observing the frenzy. He was holding a booking form for one of our river trips, so I thought I’d go over and introduce myself. He’d been studying it for some time and said he was curious about the terms of the liability release. Finally in a heavy French accent he says slowly, “…soooo mah friend, eef I drown, ees my own fault.” “Yes” I replied firmly. He took another look around the room, sighed and said, “OK… I go.” And so, we got another client (and he had a great trip). It occurs to me that back in those days, the notion of “adventure travel” was something more straightforward than the typical tourist expectations today…the ideas of risk and self-responsibility far less diluted. I have to say that living in Kathamdu back then was an ex-pat’s dream. There was just enough infrastructure to deliver the creature comforts necessary to satisfy western tastes, with none of the societal constraints of home. The crowd was an international eclectic mix of hippies, adventurers, spiritual seekers, travelers, aid workers and the occasional lost soul. The Nepalese tolerated our western shenanigans with a bemused sense of acceptance. Unfortunately, by the end of the 90’s all hell broke loose in Nepal and the Kingdom began to unravel politically. A Maoist insurgency overthrew 300 years of monarchic rule. The very fabric of the Kingdom of Nepal changed overnight for all of us. Ironically, I was also in the throngs of radical change on the personal front. My long-standing relationship with alcohol had transitioned from one of jovial friend to unpredictable foe. I guess the writing was on the wall for both the King and me – life was never going to be the same. Accepting that alcoholism was an unsustainable element in my life coincided with the massacre of the Nepalese Royal family…and as I left the country to deal with my addiction, it was with a double dose of surrender to an uncertain future. I didn’t know what lay in store for me or for my beloved Nepal. Despite the many expeditions I’d taken on rivers, overland, or in the mountains – I was embarking on the most challenging journey of my life. With the help of friends, old and new, this personal expedition continues for me to this day – I’ve taken it one day at a time and 15 years of sobriety are now in the rearview mirror. The dust eventually settled in my life and new horizons came into focus. Exciting opportunities began to present themselves and a new chapter of life began for me. Looking back at those earlier days in Kathmandu though, I realize that neither I, nor Nepal, would ever be the same again. thank you for this bro.